Karl and I recently started a house fund jar. Right now we have accumulated about two dollars worth of change(approximately enough to buy one kitchen tile). We often dream about a cozy place in the ‘burbs where he can make as much noise as he wants in the workshop and where I can freely waltz around the kitchen, stirring pots and snapping shots, without stepping on my own toes. We don’t actually plan on saving for a house via a change jar, but it makes us laugh every time we throw coins in there. Until we move into the dream home, we are staying cozy in the little apartment we have now. All signs are pointing to an early arrival of winter. For me, it’s getting harder to get out of bed. Exercising is the last thing I want to do. Laundry accumulates twice as fast, and dishes that have less than 500 calories per serving have no appeal. When the temperature fell below 40 degrees the other day, Karl and I had a contest to see who could “burrr” the loudest – he won, but I am pretty sure I was best in show. 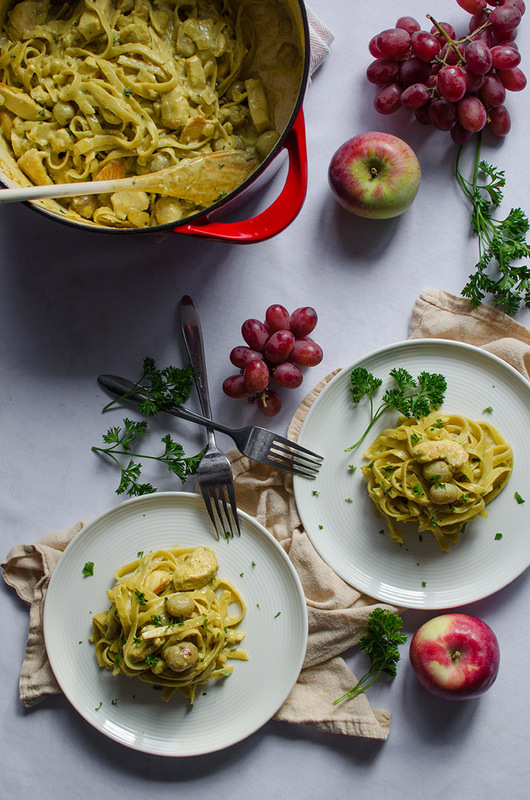 This past week, I found myself overstocked with apples, chicken breasts, white wine, and heavy cream. 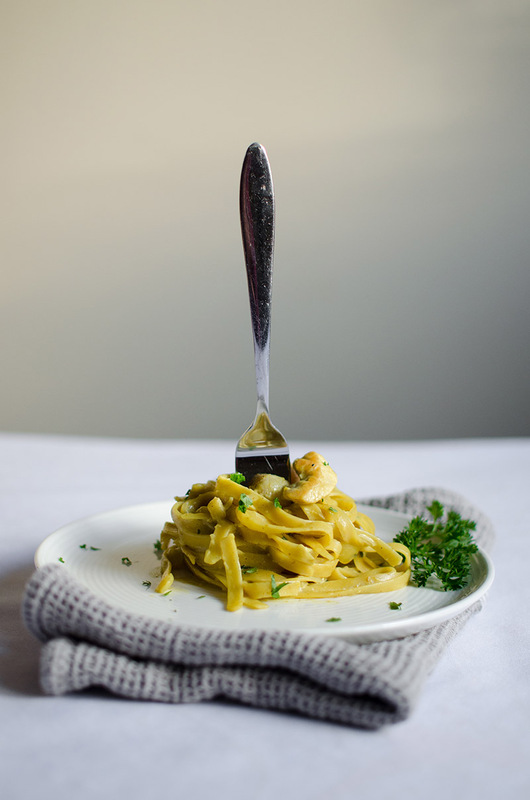 I put on my FN’s Chopped chef’s hat and brainstormed ways to spend these ingredients together. 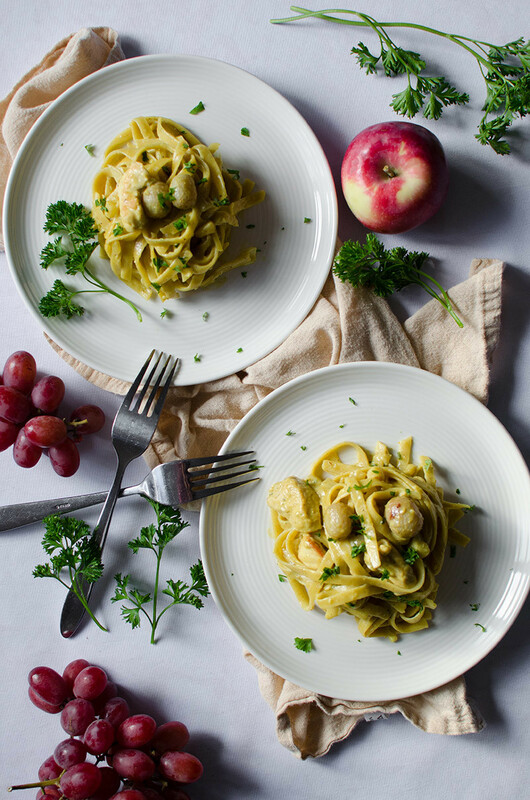 An adaptation quickly came to mind – I played with the idea of turning my chicken and grapes with curried rice recipe into a savory one-pot pasta meal. 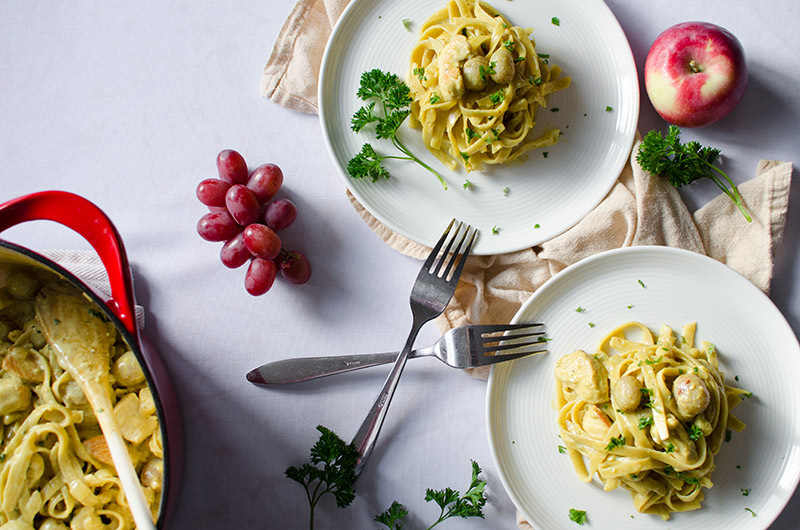 The result was this creamy curry chicken and grapes fettuccine. 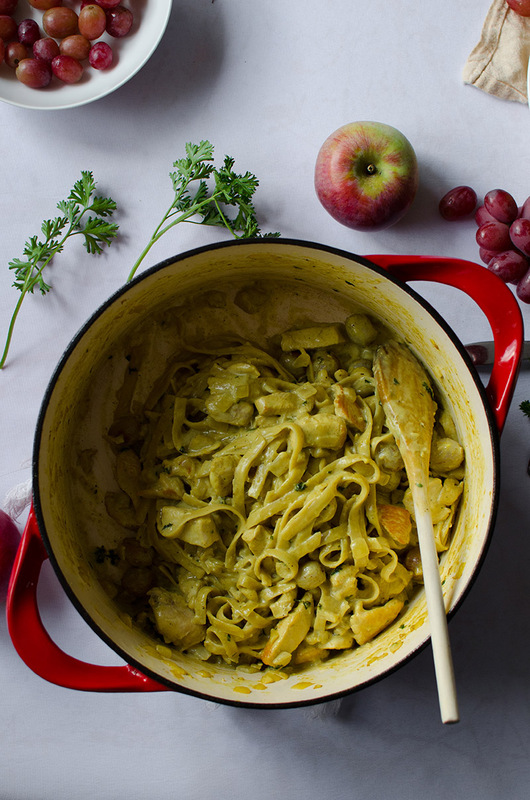 Apples, onions, and garlic are sauteed together, then spiced with curry powder and bay leaves. 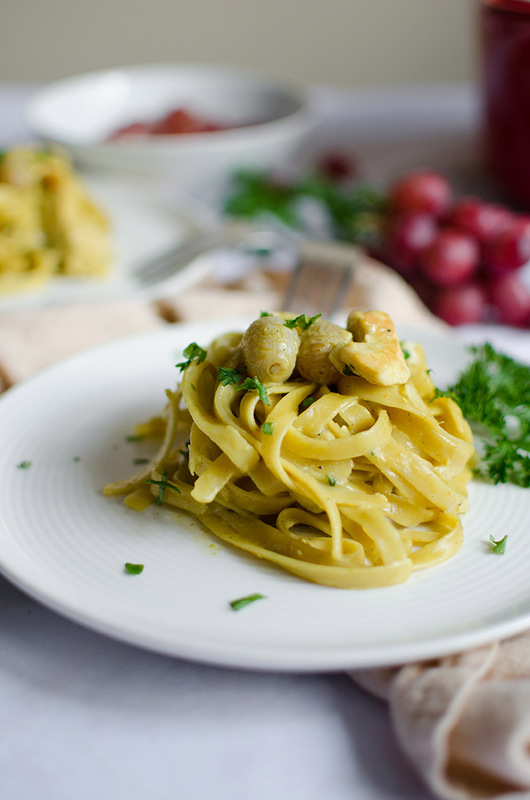 White wine is evaporated in the pot, then the pasta, broth, and grapes are tossed in to simmer until done. 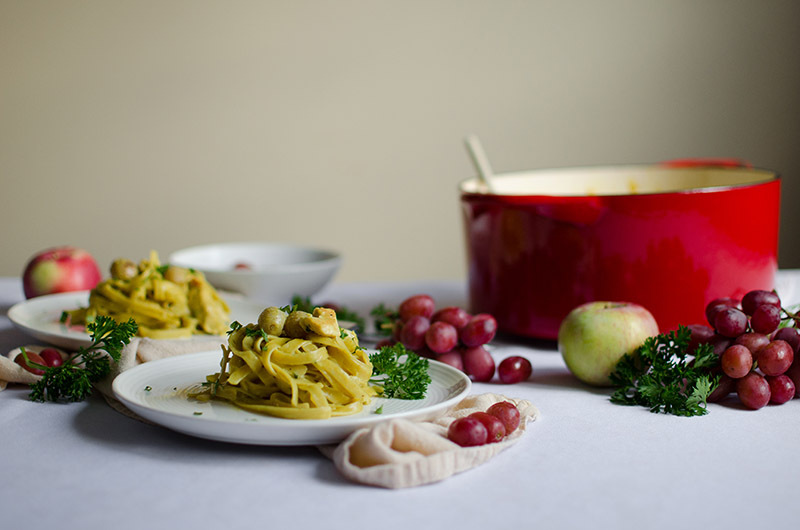 It’s a one-pot dish, which is so great because I can’t bear to do dishes when the entire kitchen feels like a freezer. This was the quintessential “easy gourmet” dish, and it was just as lovely as the gorgeous foliage in New England right now! In a 5-quart pot or dutch oven, heat up the oil over high heat. Add the chicken breast, quickly spread, then do not move the chicken around until it is mostly white (with a little pink on top). Once the chicken is brown at the bottom, season with some salt and freshly ground black pepper and stir the pieces around until it is cooked through. Plate the chicken, and set aside. If needed, add more oil to the same pot, then add the onions, garlic, and apples. Season with some salt and freshly ground black pepper. Cook for about four minutes, until soft. Add the bay leaves and curry powder, then stir around for another minute. Pour in the white wine, bring to a boil, then reduce the heat to a simmer until the liquid is mostly evaporated. Add the grapes, chicken broth, water, and fettuccini, bring to a boil, then reduce the heat and let it simmer, uncovered, for about 13-15 minutes, until the liquid is absorbed. Season with salt and freshly ground black pepper, and occasionally stir. Remove the bay leaves and return the chicken back to the pot. Stir in the heavy cream and parsley, cook for another 2 minutes. 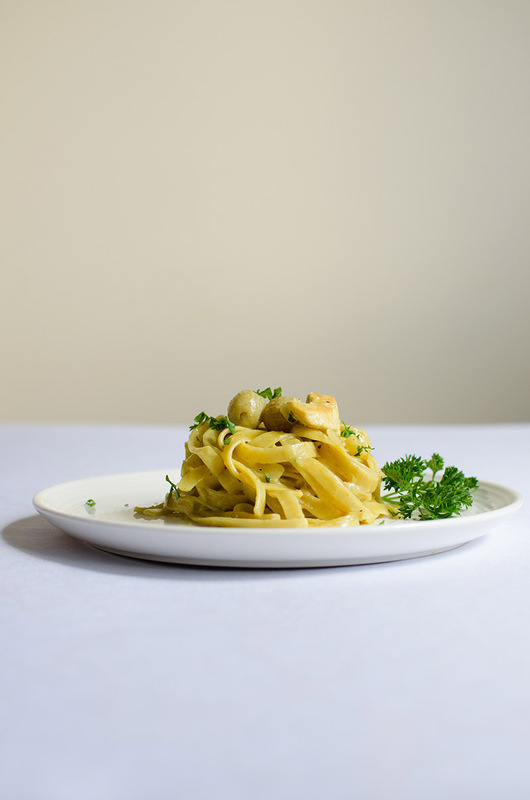 Plate the pasta, then garnish with the extra parsley. 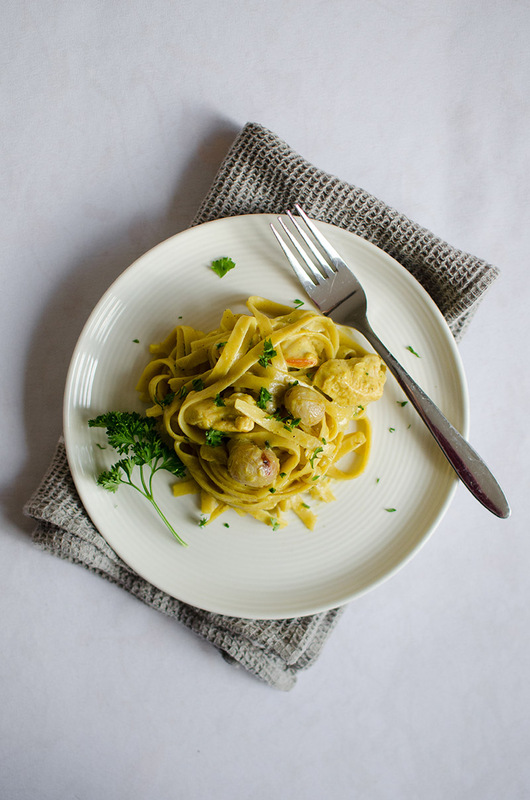 This entry was posted in Entrees and tagged apples, chicken, chicken broth, curry, fettuccine, grapes, heavy cream, one pot, onions, parsley, pasta, white wine. thanks for your nice idea of a one-pot meal using some of my favorite flavors. I imagine this would work with white rice too. Makin’ it easy and keepin’ it cozy in the winter, sounds good! 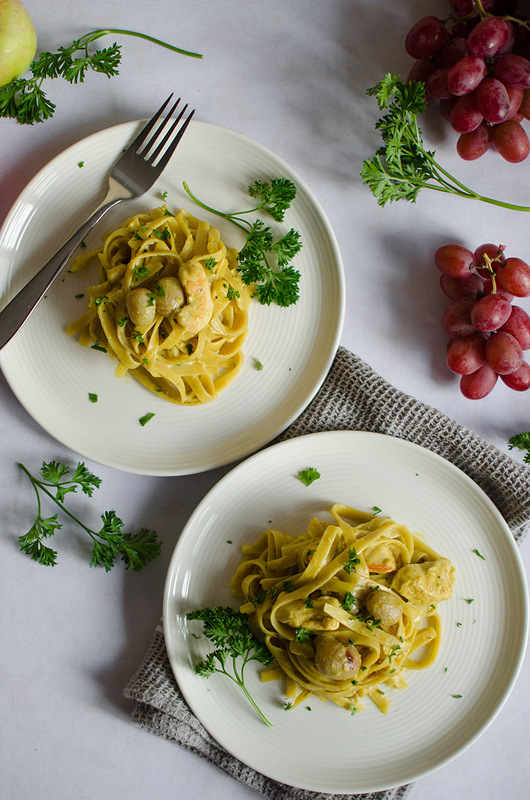 It looks so delicious, I love adding grapes to savory dishes. Never had them with pasta until now, just chicken or rice. I am pinning this, it is a great idea!